Hiking from Breckenridge to Copper Mountain on the Wheeler Trail with some off path traversal. A journey to the top of Breckenridge, Colorado's Bald Mountain in May after a snowstorm requiring snowshoes, Microspikes and poles. 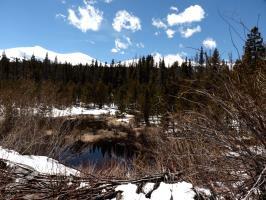 Hiking from Breckenridge to Frisco on the Peaks Trail in late May after a snow storm.